Observe how the shape of a boat affects its movement and stability. Awareness that different materials have different buoyancies. Introduction of some basic terms related to ship structure. The ability of an object to float in a given fluid, or rise through it if it has been fully submerged. A property of a material, expressed as the mass per unit volume. The body of a boat or ship. The hull is watertight. The bottommost part of a ship’s structure. The hull is built around the keel. The keel runs along the centreline of the hull. When an object is freely floating, it displaces an amount of fluid which has the same weight as itself. The upward force exerted by a fluid on an object which is partially or fully immersed in the fluid. This force is equal to the weight of the fluid displaced by the floating object. 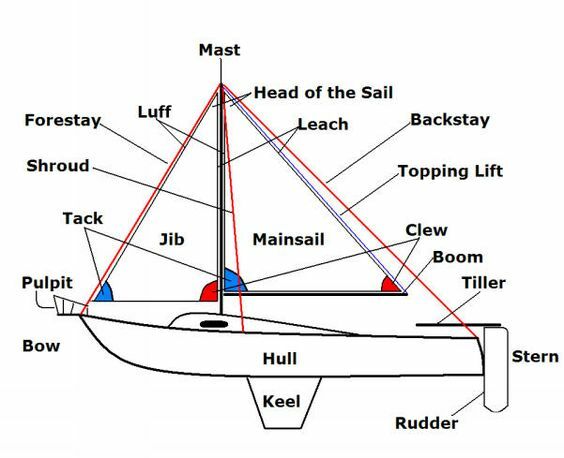 Familiarize yourself with the locations of the hull and keel on a boat by following the link. Cover the cardboard hull with duct tape to make it watertight. Fill the container (basin, aquarium or pool) with just enough water to carry out the experiment. Gently push each boat through the water and observe the boat’s speed, distance moved and stability. Record your results. The table below is an example results table which you could use. Add a small weight to each of the boats and observe how this affects the motion of each. For a fair test, ensure that the same weight is added to each boat. The second part of the experiment investigates the effect of the keel. Cut two identical hull shapes from the same material. Cut out two different keels for the chosen hull shape. One of the keels should run along the whole length of the hull, while the other should be shorter, covering only a quarter of the length. Use the hot glue gun to attach the keels to the hulls. Test out each of the boats in the water and observe the effect of the keel on each boat’s movement by filling in a similar results table to before. Add the same small weight to the boats and observe how loading affects the motion of each. Again, ensure that the same weight is added to each of the boats. Other lightweight woods instead of Balsa wood can be used. Superglue could be used instead of hot glue to attach the keel to the hull. This glue should only be used by an adult. Exercise due caution when handling strong glues. Craft knives are very sharp. Only adults should use these knives. Replace the guard after every use and keep out of reach of young children. Where possible, use recycled materials. For example, use a styrofoam block from a packaged appliance, cardboard from an old shoebox, scrap wood from the DIY store and/or collect rainwater for the experiment. Use adequate protection to prevent the work surface from being damaged by the hot glue or the water. To ensure a fair test, all boats should be loaded with the same weight. If the experiment is being carried out by very young children, ensure that the weights used to load the boats do not pose a choking hazard. Imagine you’re going rowing for a day at sea with your friend. But your friend is a bit anxious and has overpacked. They’ve got a thick, heavy book about sailing, a huge rucksack full of food and a great big sun umbrella. What do you think may happen once all those things are loaded onto the little boat and you both get in? Why does a boat sink when it’s loaded past a certain point? A boat floats because it displaces water. This means it pushes water out of the way. In turn, the water produces an upward force on the boat, which keeps it afloat. This force is equal to the weight of the water displaced. The more weight placed in the boat, the lower it sinks in the water, the more water it displaces and the greater the force acting on it. When the weight of the boat and added weight exceeds a certain value, the boat sinks. This is because the density of the boat has become greater than that of the water. What does this mean? When the sunken boat is submerged in the water, the volume of the water displaced by the boat is equal to the volume of the boat itself, right? However, the weight of this displaced water is less than the weight of the boat, meaning that the upward force on the boat is too weak to lift the boat upwards and keep it above the surface. Why do ships made of steel float, even though steel is denser than water? The boat is hollow. Average density of boat, air and cargo is less than that of water. The wind produces a force on the sail, which moves the ship. Why do boats have different shapes? Shape depends on load, required stability, sailing conditions and required speed. What are the fastest types of boats? Catamarans provide the best stability and some of the highest speeds. Why do the boats sink with loading? Average density of vessel and loading is greater than the density of water. This experiment investigated three aspects of ship design: material, hull shape and the keel. The material used to build the ship affects its buoyancy. The water exerts an upward force on the boat which is equal to the weight of the water the boat displaces. This force is called the upthrust force. A material floats in water because its density is less than or equal to the density of the water. All the boats floated, indicating that their overall density was less than that of water (1000 kg/m3). For a boat with the same hull and keel, the less dense the material, the faster it can skim the water, but it may be less stable since it has a lower inertia. Hull shape affects maneuverability and speed. Round bottom boats maximize the amount of water displaced and provide a smooth ride, making them ideal for cruise ships and sea boats. Boats with Shallow V-shaped hulls move faster than those with round hulls because the shape increases the upward forces exerted by the water on the boat as it moves. While boats with round and deep V-shaped hulls cut through the water, flat bottom boats travel on it. This makes them popular for travelling in shallow waters but they are less comfortable in rough conditions. The keel can affect speed and stability. A long keel along the length of the boat can give a comfortable ride and increase control over the ship’s motion. However, this slows the boat down. Boats with shorter keels may have less stable structures but have higher speeds and lighter steering. The choice of material affects the maneuverability of the boat. According to the law of floatation, when an object floats freely in a fluid, the weight of the fluid displaced is equal to the weight of the object. In order for an object to float, its overall density must be less than that of water. Table 1 shows typical densities of the materials used and that of pure water. The density of the material affects the overall mass of the boat. The heavier the boat, the greater it’s inertia and the less speed it will tend to gain compared to a lighter boat of the same design, provided with a similar initial push. A larger inertia, however, could make the boat more stable in choppy waters. The shape of the hull affects maneuverability. Displacement hulls (round hulls) are only subjected to the upthrust force of the water, which keeps them afloat. V-shaped hulls exploit hydrodynamic lift, which enables them to achieve better speeds. Semi-planar hulls have a shallower V than planing hulls. Semi-planar hulls offer good mileage and a relatively comfortable ride, making them ideal for yachts and trawlers. Planing hulls (include flat bottomed and specially shaped deep v-shaped hulls) are built for power and speed but this can result in ‘slamming’, leading to an uncomfortable journey. They are designed to experience better lift than the shallower hulls previously mentioned. Planing hulls are usually used in small, recreational vessels. Boats and ships are used in various industries. Cargo ships transport products across the globe. In fact, 40% of EU products travel by ship before reaching consumers. Navies use a range of different vessels, from aircraft carriers to tugboats. Boats are an indispensable tool to the fishing industry. Ships are also used for leisure and tourism, such as yachts and cruise liners. Sport keel boats are used in competitive sports. The design of the ship depends on the application. Designers must factor, amongst other things, the sailing conditions, loading, speed range and density of the material the boat will be made of. Shipping generates 4% of the EU’s greenhouse gas emissions. Current research has been focused on producing more efficient ships which would cost less to run and be more environmentally friendly. One study investigated how innovative hull design and propulsion mechanisms could improve efficiency. The study took ideas which worked in theory and tested them using advanced computer simulations. Questions the research explored included: Can these technologies be applied to full-sized ships? By how much can the efficiency be increased? How much would it cost? How cost effective are these technologies? What are the implementation problems? The simulations not only confirmed that the technologies hold promise, but are now helping researchers solve issues with implementing them on actual ships. Try adding sails to the boats and observe how they affect speed and stability. A mast could be made using a straw or ice cream sticks. The sails could be made using paper or lightweight material from old clothes. Testing the boats in a draft or on a breezy day may give the best results. Try loading each boat to its maximum capacity. To do this, keep adding weights to each of the boats until they just remain afloat before sinking. Use weighing scales to record the maximum load each boat could support. Compare the maximum loads to the material used, hull shape and boat size. What do you observe? Add rudders and tillers to the boat. What materials can be used for this purpose? Observe how motion can be altered and controlled using these structural features.